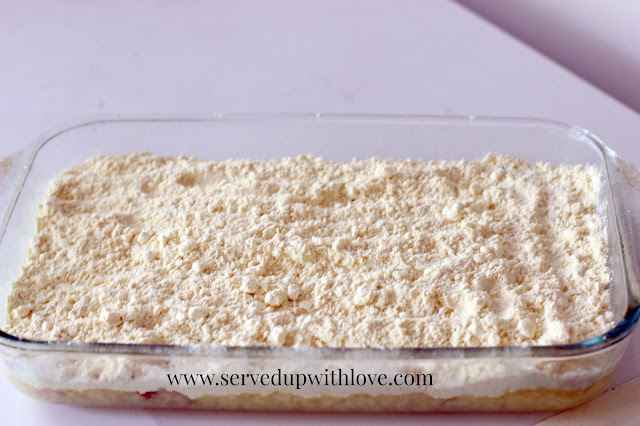 Dump cakes are some of the easiest desserts you can make. 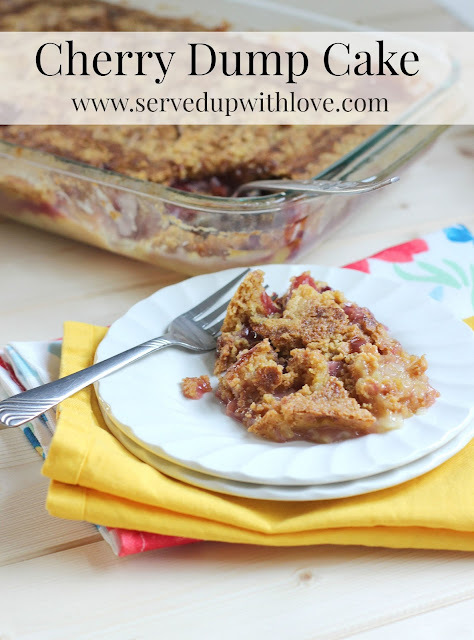 Cherry Dump Cake has layers of pineapple, cherry pie filling, cake mix, and then its topped with butter. This cake is prepared just like what the name implies. All the ingredients are "dumped" in the dish and baked to perfection. 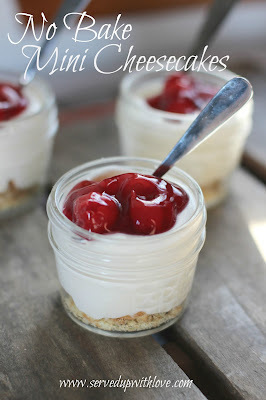 I just love making desserts that take hardly any effort and the end result always gets rave reviews. Lemon tops my list of favorite flavors but second to that is cherry. I guess maybe I just like the little bit of tartness that these two have. I really never thought about that until now. Just look at all those cherries. I am in love! I had made dump cakes in the past but still had unbaked cake mix sitting on top after baking. Some may like that, but for me, I didn't. That was because I just sat little pats of butter all over the cake instead of melting it and pouring over the cake mix before baking. I found that melting the butter made it so much better because it soaked into all the cake batter. 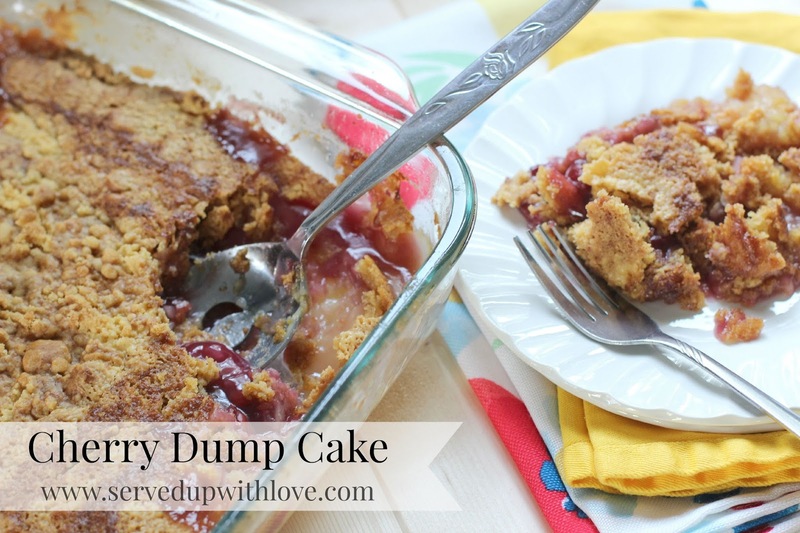 If you are looking for an easy dessert to take to any kind of gathering, I would highly recommend a dump cake. Even if you don't think you can bake, you will rock at making this cake. Serve it warm with a dollop of cool and creamy vanilla ice cream to take this cake over the top. Grease a 9 x 13 baking dish. Pour in the crushed pineapple and juice and spread out on the bottom of the pan. Pour the cherry pie filling on top (it will not spread out evenly-spoon it on as evenly as possible). 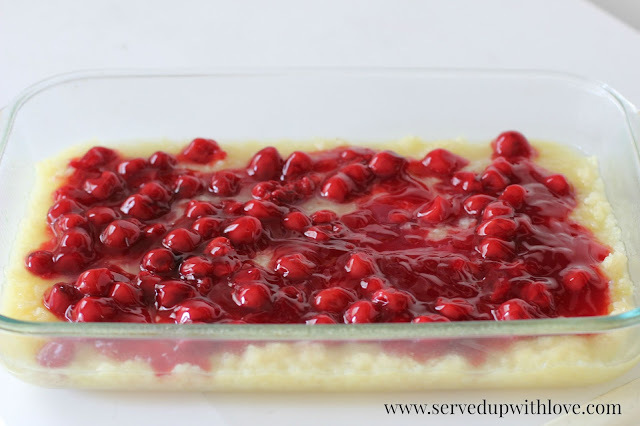 Sprinkle cake mix over the cherries. Melt butter and spoon over mixture. Bake at 350 degrees for 1 hour. *This recipe was recently shared in my monthly column in Chesapeake Style Magazine.